In 1974, plans were drawn by Prof. Gordon Smith of the School of Architecture, Auckland University for free. He was a friend of Elizabeth Mountain Ellis and her husband, Robert. It is a building with rural colonial charm and is a treasure of New Zealand architecture. It was built primarily by Tamati Herewhitu and George Hakaraia, assisted by local men. 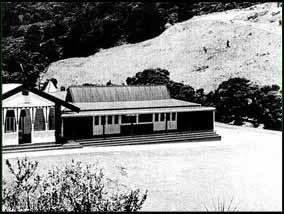 The wharehui was shifted and foundations were laid for a new dining room, kitchen and ablution block. Funding came from fundraising ventures selling seafood and animal carcasses when Camphylobacta and associated bugs were obviously not here and fishing quotas were unborn. The carving was led by Moka Puru and Hone Heke. With great energy and skill, they were completed and the community joined to raise them in to position. 1977 The renovated complex was opened with huge ceremony. Three busloads came from Turangawaewae. All the whanau were there. The name of the wharekai was re-dedicated and the new building was blessed. 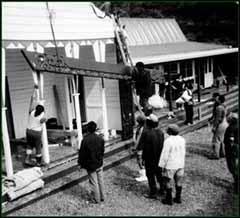 1978 The Cookhouse was built. Since then the marae has been self supporting. 1987 The Memorial Monument, previously in the middle of the Atea, was moved on to the hillside by the Wharehui. 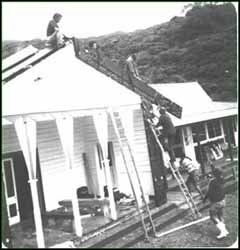 1996 It became obvious that the need for extensions and upgrading of the marae was required to meet the current needs, and cope with the increasing numbers. An architect, a friend of Elizabeth and Robert Ellis, of Jasmax, an architectural firm in Auckland, drew up preliminary drawings for renovations out of interest in the project. There was no driver for the project and it stalled. We have since made good progress in developing the marae again. Go to the Marae Development page to find out more information.